The Notre Dame football star, whose fake Internet girlfriend never actually died from Leukemia because she was never actually real, will speak on camera to Katie Couric next week. According to Brian Stelter at Media Decoder, Manti Te’o and his parents will sit with Couric — the two share a spokesperson in Matthew Hiltzik — for an interview that will be shown on Thursday’s Katie, with teaser excerpts running on various ABC News programs throughout the week. 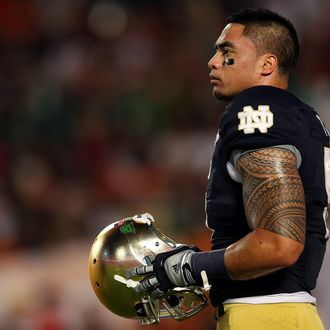 Previously, ESPN reporter Jeremy Schaap got Te’o for a two-and-a-half-hour interview on Friday night, but off-camera. Among the myriad questions Couric likely has for the linebacker might be Notre Dame’s decision to withhold information about the catfish scam until after the BCS National Championship football game.